A male Macropodus ocellatus in full glory. Way back in the dark ages of 2012, I only had access to a simple point-and-shoot digital camera. The wonders of finely detailed DSLR macro-photography were not yet available to me. However, my fish continued to spawn, and I did my best to document their behavior with what tools I had available to me. This is the story of a breeding project from back then. I have a special place in my heart for the labyrinth fish, those perch-like fish of the Anabantoidei suborder. 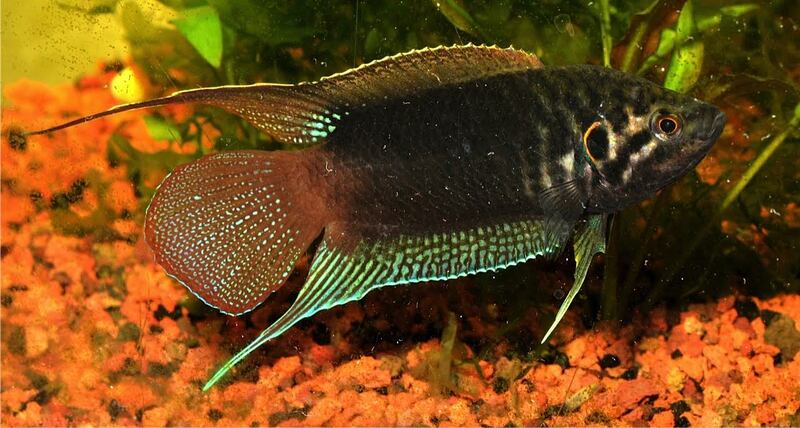 They share the keen intelligence and behavior of those other, more celebrated, perch-like fish, the cichlids, while adding layers of interest in the form of wild species diversity, interesting parental care behavior, and a beauty that recalls the exotic Orient, where most anabantoids reside. Besides the popular Betta splendens and a host of ornamental gourami species, there are scores of obscure labyrinth fish species ready to whet the appetite of the serious aquarist ready for a new challenge. One such species is Macropodus ocellatus, the Roundtail Paradise Fish. Macropodus ocellatus is a northern fish, native to China, Japan, Korea, and Siberia. It can handle near-freezing winter conditions and thus makes an excellent subject for unheated aquariums or temperate outdoor ponds. In nature, this species is found in rice paddies, sluggish drainage ditches, and ponds; like all labyrinth fish, it is tolerant of water bodies with limited dissolved oxygen. The seasonal shift in temperatures from winter’s cold to summer’s heat is an important factor in the long-term maintenance of this fish. 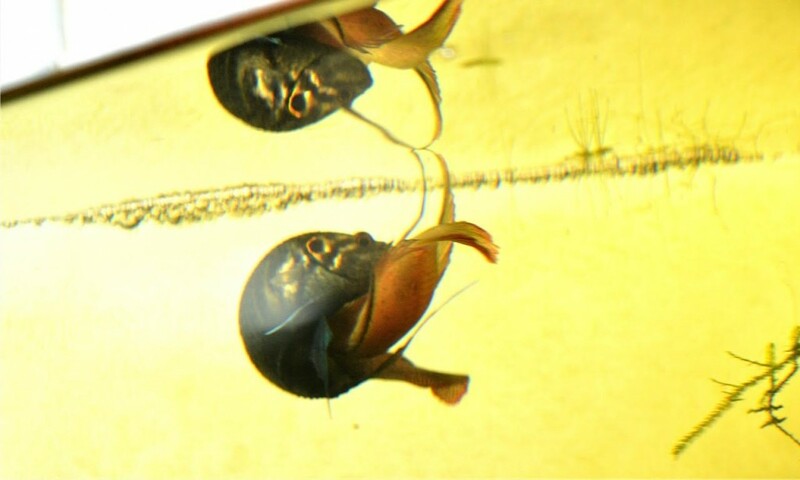 For breeding my Macropodus ocellatus, I found it best to condition the male and female separately in different aquariums. 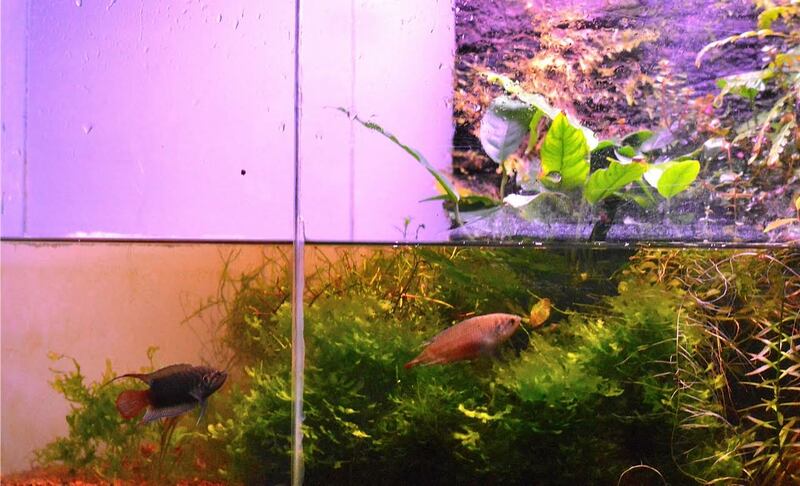 I did not want to risk losing my only female to an overly aggressive male, and I also wanted to time their breeding with the summer season, because I wanted to raise some of the fry outdoors. The male had been residing in an unheated, partially-filled aquarium in my bedroom throughout the winter and spring, and as temperatures rose with the summer season, I had hopes that he would soon be ready to breed. The author’s unheated paludarium-style aquarium for breeding Macropodus ocellatus. He did not disappoint. As soon as I introduced the female to his aquarium, a metamorphosis began to unfold. The male’s normally drab colors exploded in a riot of beauty that is only seen when the fish is courting or fighting. When the female M. ocellatus is ready to breed, she will turn a uniform light beige color, very much in contrast to the male’s gaudy dress. The male will then commence to blow a bubble nest, that curious invention unique to many species of labyrinth fish. A male and female Macropodus ocellatus show an incredible contrast in color during a spawning event. Outside of spawning, both fish look similarly drab. The male will then parade beneath the bubble nest, wagging his body beneath it and advertising it to the female. 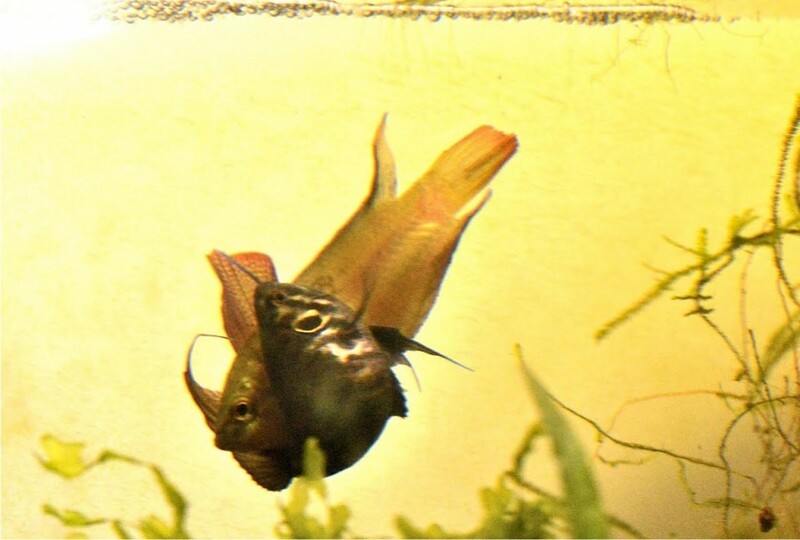 After some inspection of the male and the bubble nest, the female will then join the male in a spawning embrace. This is a very easy fish to breed. 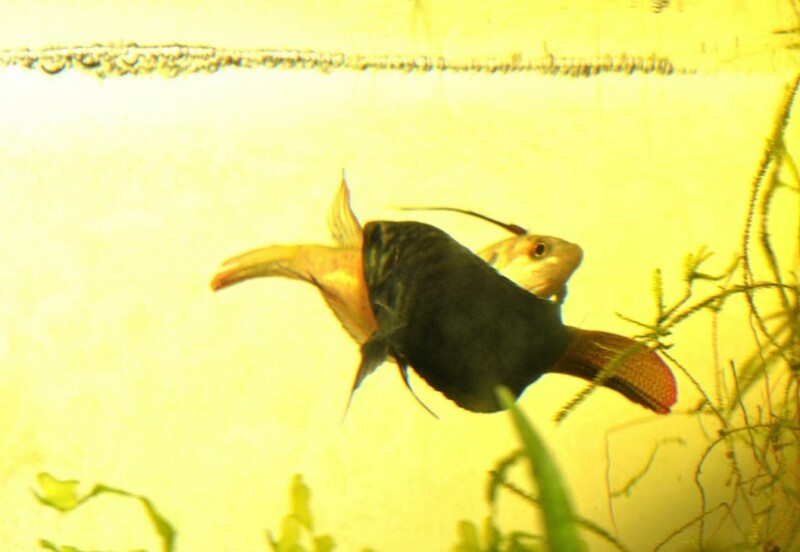 The first stage of a Macropodus ocellatus spawning embrace. The male and female embrace and begin to spawn below the bubble nest. There are few sights available to the aquarist that are more beautiful than the languid spawning embrace of labyrinth fish. After each embrace, the female will shed eggs, the male with fertilize them, and the eggs will drift through the water column. The male will then break free of the embrace, grab each egg in his mouth, and deposit them within the matrix of the bubble nest. It is a sight to behold and can last over an hour. The female will observe and patiently wait for the male to return for the next spawning embrace. After spawning, the male will tend the developing embryos dutifully, and the female will try to avoid his attention. 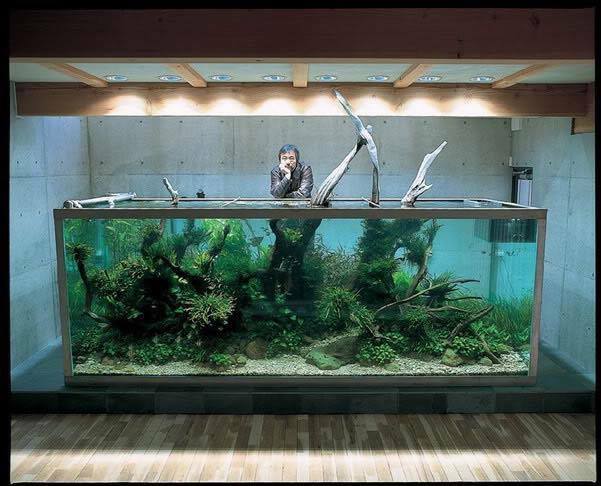 In a small aquarium, it is probably best to remove the female at this stage. 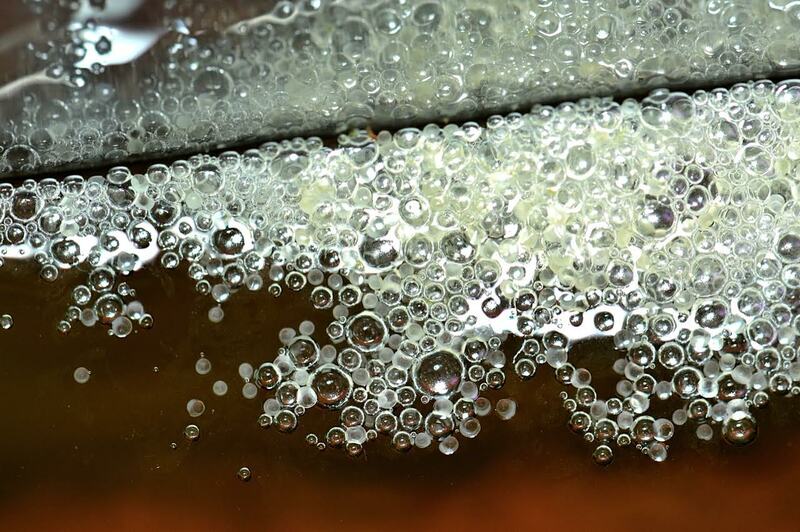 A Macropodus ocellatus bubble nest filled with eggs. Macropodus ocellatus is a fecund fish, and hundreds of eggs can fill a spawn. It is important to keep a column of warm, humid air in the space above the nest so that the fry can develop their labyrinth organ properly. In short order, the fry will begin to hatch, and dozens of babies will then swarm the upper levels of the aquarium. At this stage, I scooped up several dozen fry and transferred them over to a small outdoor pond where they could feed on the rich soup of microorganisms within the pond. If well-fed, the male will most likely not eat the fry, and some can be left with him in the aquarium. In the pond, the fry will continue to grow throughout the summer and fall and can be left to overwinter outdoors or in a protected location in extremely cold climates. Newly hatched fry of Macropodus ocellatus dart about the surface of the aquarium. Macropodus ocellatus is a wonderful fish with a special beauty that deserves more attention from aquarists. Its ability to withstand near-freezing conditions (37 degrees Farenheit) is an attractive attribute for aquarists looking for a unique addition to a small outdoor tub or pond. In recent years, imports of this fish from China have been made available in the trade, though I have not seen many lately. It might require the diligent efforts of advanced aquarists to keep this species circulating in the hobby. I hope you have enjoyed this TBT. Next time, I will return with some higher quality photos!